Introducing Brian Tracy's "Sales Success Made Simple"
The REAL Secret to Landing More Clients, Closing More Sales, and DRAMATICALLY Increasing Your Income! The good news is that exceptional sales people can still count on a great income — and I’m going to show you exactly how to become exceptional. You’re covered by my 100% Satisfaction Guarantee — that is, buy the product, try it for 365 Days, and if it doesn’t meet your expectations, you can return it for a full refund. No questions, no hassles. I am convinced that anyone who commits to Brian’s materials will succeed in sales. I don't think there are very many coaches who can have that impact. Thank you for everything! Brian Tracy’s sales training programs are pure fundamentals -- required training for ANY sales professional. Invest in this program and study it. It is literally worth its weight in GOLD! A successful sales career skyrocketed my success — and now I’m the owner of a multi-million-dollar international company. I want to share with you how sales turned my life around — and it can turn yours around too! Order “Sales Success Made Simple” now and get started! Sales was a big mystery for me when I started my career. Like gambling - if you are lucky, you win. My career began to change whe I realized one thing - that success in sales is not luck, it`s a science. And science is something you can learn and understand. It has rules, principles and logic. And the good news is that those rules are the same for everyone, like gravity. 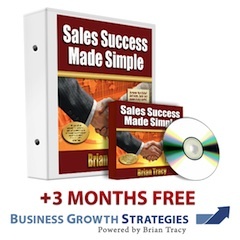 B. Tracy and his sales programs are one of the best tools in the science of selling I have ever found. And I can tell you it works. The question is, are you ready to put it to work? Whether you are struggling with sales or achieving your sales results the Sales success made simple is a must have. The way Brian presents his ideas are simple yet easy to implement in any business. His ideas have helped me change and update my business to meet with the market. I have converted the most inexperienced sales people into Selling Superstars by implementing Brian's ideas. Paid for itself it's first week. I have been I commission only sales for twenty years. After a serious car accident six years ago I struggled to stay at the top until this year I found myself three from the bottom in a twenty strong sales team not realizing it was me who was letting the injuries I sustained in the accident effect you attitude and ultimately my sales. The last three weeks have seen my sales figures higher than what they were six years ago when I was taking home between $2500.00 to $3000.00 per week. In the last three weeks I have averaged $4000.00 per week and just over six weeks ago I was having trouble taking home $800.00 a week and in the past year I have even had weeks without any income. This Program has re-enforced what was doing right and what I had let slip over the years plus new insight that I had been missing.